Spring came, and with it the runoff, snow melting out of the high country and swelling the rivers to brown, churning overflow. All but the Clearwater, which flows out of a chain of lakes and thus stays clear. The fishing is never very good but it will fish when nothing else will. So: sunny afternoon, pleasantly cool, I am waist-deep in the water, casting to the far bank when I get the feeling that I am being watched. I turn around. A small bear stands on all fours on the bank, a dozen feet away. I don’t make eye contact. I expect him to flee, as black bears usually do, but this one doesn’t. He stands up on his hind legs and growls at me. The sound goes right through me, some deep-rooted fear that’s older than humankind. The bear drops to all fours again but stands his ground. I turn my back on him and start to walk down through the water, letting the current push me along. A hundred yards and I’m not dead yet. I turn around and he’s walking the bank behind me. When I turn, he rears again on his hind legs. No eye contact, I remember. I turn again and go, down the cobbled stream bottom, closer to where the car waits. When I get to the car, he’s just gone. It’s like he never existed. The woods are ordinary green and ordinary quiet and the river runs quietly in its banks. I could start fishing again if I wanted to, which I don’t. I put the rod away with shaking hands and open a beer. This could have ended some other way. A wildlife biologist told me later that it was most likely not a black bear but a yearling grizzly. When I think about wild lands and free country, I come back to that bear, a distillation of everything that matters: wild, powerful, indifferent to my well-being. He was the one in charge of that encounter. He chose to have it, chose the outcome. The million acres of forest behind him all came to a point in his eyes, and he was looking at me. 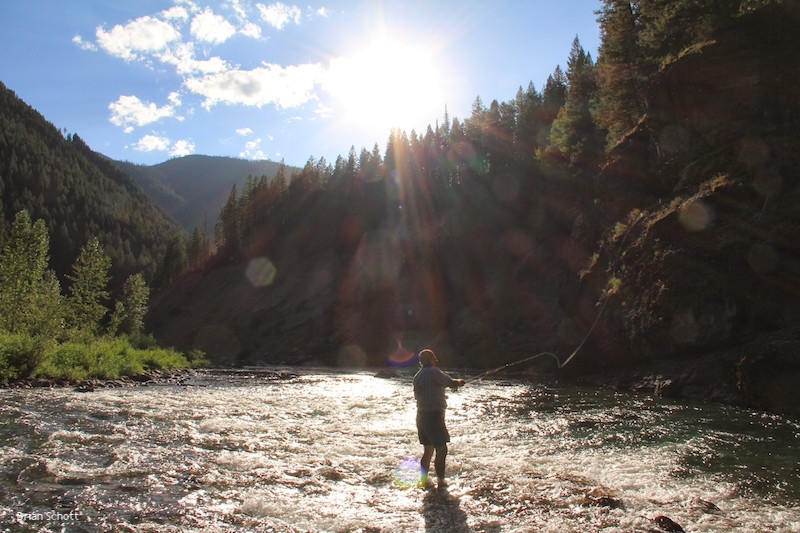 It’s possible, even useful, to think of these places instrumentally: wild lands make for clean water which makes for good fishing which is good for tourism, etc. There are sound practical reasons to preserve our wilderness. But these are not my reasons. I want to be touched by mystery, to walk in a place that surpasses my idea of it, to not be in charge for once. I want to touch something greater than myself. And this is where it is. Kevin Canty's seventh book, a novel called "The Underworld," was published this spring.